What must be checked before to buy a C mount lens? Posted: Sat Jan 23, 2010 2:20 pm Post subject: What must be checked before to buy a C mount lens? I'm still waiting for adapters (Nikkor and C mount) witch I hope will arrived next week.....C mount word is quite new for me and if you look on e-bay, some lens are verrrrrrrrrry expensive and probably above my budget .. If the lens are not in so good condition and need a �CLA� service, is there service company who could do that job for C mount lens??? Your advises/help is for sure Welcome ..
Prices on these lenses have exploded since the MFT format came out, and I assume they are also used on some movie cameras. 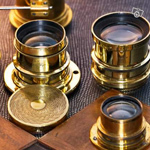 Basically, you want to check for the same things as with any other lens, like haze, fungus, dirt, easy moving rings etc. Depending on the age, many of them will benefit from changing the grease to run smoother. It's difficult to give specific recommendations, but generally all the good companies have great lenses - and Angenieux is one of the best of them from all I know. However, most lenses will show vignetting up to about 25mm, some more, some less. I had the Angenieux 25/1.4 and two versions of the 25/0.95 - all three are very nice but they all have slight vignetting, the 1.4 has the least. The 50mm is supposedly very good but extremely rare - if you find one you don't want, please let me know I also never tried the 75mm one but only heard good things about it. Personally, I also like Schneider lenses and some of the Kerns. Another good producer is Taylor & Hobson (Cooke lenses). Unfortunately, all of them have become quite expensive.... A little cheaper but sometimes still very good are video or TV lenses. The Tevidons from Zeiss lead the field from everything I have seen, but they are also very pricey. Personally, I found some Canon TV-16 lnses that have a good overall quality. And finally, there are the CCTV lenses, some of which are also excellent. A good one you can get new for under $100 is the Pentax 25/1.4 - a very tiny lens but it almost covers the sensor completely and the images are really nice. Others that have a good reputation but are harder to find are Computar 25/1.3 and Fujinon 25/1.4 - just make sure to look for the right versions, you need the ones made for 1" cameras; they still show a bit of vignetting but are very useable, and sometimes you still can find them cheap on ebay. Some of them may need very slight modifications to perfectly fit the adapters, otherwise they won't reach infinity focus. In case the lens(es) have to be repaired/fixed, do you may be know if there is service company who could do that job for C mount lens???? Very nice - well, if you need a taker for the 50/1.5 or one of the 75/2.5s, let me know I also had a 10/1.8 once, but I wasn't sure what to do with it, it's a fixed focus lens and heavily vignettes on the MFT, so I sold it off. As for service places, I'm afraid I can't help much. I am in the US and 'my' technician sems to have health issues and may retire or limit his work load, so I am not sure what will happen. You might also prefer a place closer to you, and maybe someone from Europe can chime in here. I dug up a Som Berthiot Pan-Cinor f3.8 17-85 Zoom will try it out with my C-mount adapter. Initial tests indoors is that the wide end vignettes a lot. Will check it outdoors the next nice day here.